disappointed the game was only being released in Japan. It took two years, but The Pokemon Company is finally letting the well-spoken sleuth off the island. It was announced today that Detective Pikachu will be released as a Nintendo 3DS exclusive in the U.S. and Europe on March 23. The Western launch coincides with the Japanese release of the second episode of the game. Western players will receive both episodes with their purchase. Detective Pikachu follows the only Pikachu boasting a full vocabulary and his young sidekick, Tim Goodman, as the duo traverse the streets of Ryme City, investigating the disappearance of Tim’s father and helping humans and Pokémon they meet along the way. Not only is the game coming Stateside, but so is a brand-new Amiibo of the coffee-guzzling titular character, only this Amiibo dwarfs many others. 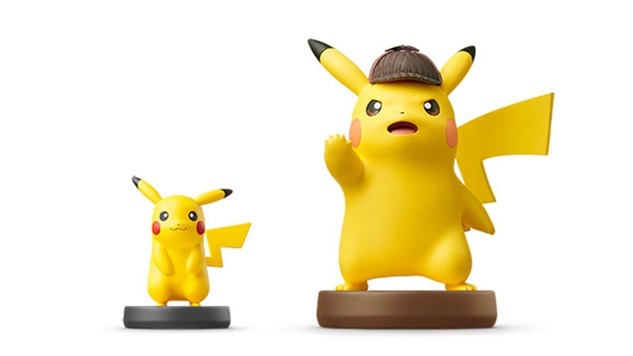 At just under 14 centimeters tall, it’s almost double the size of the Super Smash Bros.-edition Pikachu Amiibo. Not only will it serve as the cutest kaiju on your toy shelf, but it will also reveal “Pika Prompts” within the game that will help players find clues. The news of the wide release seemed inevitable after the announcement last December that Ryan Reynolds would provide the voice and motion-capture for the Poké-gumshoe in a live-action film adaptation, but the news was all but confirmed when the game was rated by the European ratings board PEGI. Shine up your magnifying glass and check out the trailer for the second episode of Detective Pikachu below.